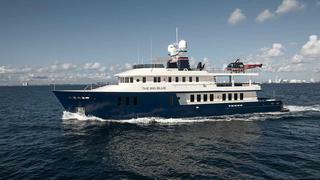 The 42 metre expedition yacht, The Big Blue, listed for sale by Ben Snead at Expedition Yachts International, has had a further $1,000,000 price reduction. Built by Turkish yard Troy Marine in steel and aluminium to a design by Ugur Isik with a bulbous hull and launched in January 2010, The Big Blue was built to Bureau Veritas class. An interior by Luiz de Basto sleeps 10 guests in five cabins consisting of a main deck master suite, VIP suite, a double and two twin cabins, all with en suite bathroom facilities. In addition, there are quarters for six crew. Formerly named Imbros, the interior of this yacht for sale is luxurious and she has ample storage and refrigeration spaces for extended voyages. Powered by two Volvo 750hp engines, she offers economical cruising at 12 knots with a range of 4,300 nautical miles and is fitted with zero speed stabilisers. The Big Blue departed the Derecktor Shipyard in Florida on 12 September 2013 for sea trials after 15 months at the yard. Work involved overhauling various systems aboard, a complete interior refit with changes to the layout and the addition of a heli-deck, requiring major structural changes. So successful was the refit that she was nominated as a finalist in the best refitted yacht category at the 2014 World Superyacht Awards. She went on to have a full repaint in January 2015 and passed her five year Bureau Veritas survey with flying colours. Lying in West Palm Beach, Florida, The Big Blue is down to $11.95 million.